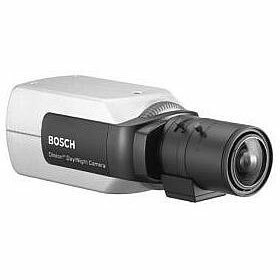 The LTC 0495 High-Performance 1/3-inch Digital CCD Day/Night Camera ensures the highest image quality possible at any time. Depending on the available light the camera will automatically switch from colour to monochrome. A unique combination of 15-bit digital video processing that enhances sensitivity and XF-Dynamic which extends the dynamic range provides a sharper, more detailed image with outstanding accuracy in colour reproduction. All Dinion cameras are supplied ready to operate. Simply attach and focus the lens, then connect power. No tools are required for back focus and power connection. For especially challenging situations where fine tuning or special settings are required, the camera parameters can be individually set using the control buttons on the side of the camera and On-screen Display (OSD). The camera automatically detects the lens type. The Lens Wizard ensures accurate back-focusing for perfectly sharp pictures at all times. The highly accurate 15-bit digital signal is automatically processed to optimally capture the detail in both the high and low light areas of the scene simultaneously, maximizing the information visible in the picture. Bilinx is a bidirectional communication capability embedded in the video signal of all Bosch Dinion cameras. Technicians can check status, change camera settings and even update firmware from virtually anywhere along the video cable. Bilinx reduces service and installation time, provides for more accurate set-up and adjustment, and improves overall performance. In addition, Bilinx uses the standard video cable to transmit alarm and status messages, providing superior performance without additional installation steps. The built-in video motion detector allows you to select up to four fully programmable areas with individual thresholds. The global scene change detector minimizes false alarms caused by sudden lighting condition changes, such as switching on or off the indoor or security lighting. When motion is detected alarms may be displayed in the video signal while the output relay can be closed in addition to alarm message transmission on Bilinx. The automatic black level feature enhances contrast by compensating for reduced contrast (i.e. glare, fog, mist). The LTC 0495 features a fast, default shutter speed insufficient lighting conditions to capture moving objects. When light levels fall and other adjustments have been exhausted, the shutter speed reverts to the standard setting to maintain sensitivity. The Lens Wizard automatically detects the lens type and helps focus the lens at the maximum opening to ensure proper focus is maintained throughout the 24-hour cycle. No special tools or filters are required. Three independent, pre-programmed operating modes support typical applications but are fully programmable for individual situations. Switching between modes is easy via Bilinx or the external alarm input. The Day/Night Mode LTC 0495 provides enhanced night viewing by increasing the IR sensitivity. The IR filter can switch from colour to monochrome automatically by either sensing the illumination level or via the alarm input. The filter can be switched manually via the alarm input, through the camera menu or via the Bilinx coaxial control interface. An internal through the lens IR detector enhances the monochrome mode stability, as it prevents reverting to the colour mode when IR illumination is dominant. By increasing the integration time on the CCD up to 10 times, the effective sensitivity is dramatically enhanced. This is especially useful when relying only on moonlight for illumination.